The world of credit counseling is filled with companies looking to make a quick buck providing advice on how to reduce or consolidate your debt. It’s a dangerous industry because your credit is such an important part of your daily life. Your credit score is used in everything from your cell phone service to renting an apartment so it’s not surprising an entire industry has cropped up to “help you” in your time of need. One of the oldest organizations in the credit counseling world is the National Foundation for Credit Counseling (NFCC). Founded in 1951, the NFCC is a nonprofit organization that focuses on financial education and helping people understand the intricacies of personal finance. NFCC helps fill the gap, since most of us don’t get enough financial education in school and so oftentimes the best sources of information are online. Just because an organization is a nonprofit doesn’t mean that it’s all sunshine and rainbows. While a personal finance guru’s endorsement is hardly proof of fidelity, I was pleasantly surprised to learn that Jean Chatsky endorsed them. She’s often mentioned the NFCC as a great resource, whether it’s a blog post or on television, I doubt she’d support an organization without good reason. In addition to online education, they are seen as an independent certifier of credit counseling agencies based on their standards. In order to be certified by the NFCC, you need to have a process in place that includes auditing operating and trust accounts each year, offering consumer education programs, provde detailed reviews of consumer financials and an assessment of how they got into trouble along with a written action plan. They also must give clients a financial statement at least once a quarter. These are strict requirements that are seen as a standard in the industry, very similar to the Association of Independent Consumer Credit Counseling Agencies. 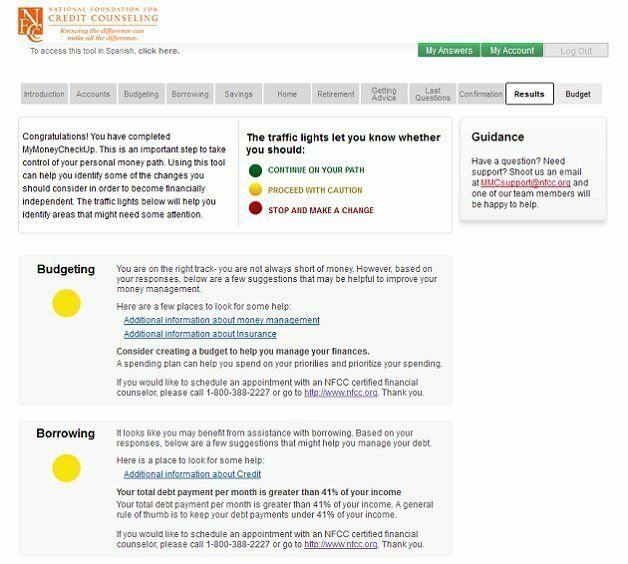 In 2011, they released a tool called MyMoneyCheckUp that helps people get a better understanding of their finances. More recently, they released a Spanish language version of the tool so it can reach a fast growing section of the population. The tool is simple and takes about ten to fifteen minutes to complete. It has nine sections, covering everything from your accounts to budgeting to savings, home, retirement, and borrowing. Each section has just a few questions and culminates in a traffic light style summary that gives you an idea of what you may need to focus on and where you’re in good shape. The benefit of the tool isn’t in getting tailored information. It’s value is in how, through your answers, it can give you ideas of where you might want to focus your time to ensure you are getting a complete picture of your finances. For example, the borrowing section works off a simple rule — it’s good if you spend less than 36% of your income on debt each month, it’s bad if you spent more. For many readers of personal finance blogs, we know this. Some would argue that 36% is probably too high! But there are plenty of Americans out there who don’t even think about this, much like they don’t think about a budget or an emergency fund or any of the other things personal finance bloggers write about quite often. This is the value of the tool, it’s in education and not necessarily the numbers being used. If you get a chance to use the tool, please let us know what you think about it! Jessica Wagner is a freelance personal finance writer who is starting to get serious about her finances. @Kurt – thank you for your input. It’s good to know that another PF blogger can vouch for this organization.